As a flight attendant and a mother to a 22 month old I know all too well the travel mistakes many parents make. Summer is a stressful time to travel but in reality it doesn't have to be. Of course, you can't control all of the elements such as weather, plane mechanicals, and missed connections. And of course tantrums (and not just the children...cough cough). There are so many neat travel gadgets out there that can simplify the travel process. Here are just a few of my favourites. Of which are on my shopping list for my next flight. 1// the Trunki Suitcase: every traveller should have their own suitcase! If you buy one for your toddler this suitcase will last for a few years. Pass it on after to their siblings. What I love about the Trinki is your child can sit on it and use it as a ride. 2// the CARES Safety Harness: is a must-have for children between 22 and 44 lbs able to sit upright. It's an extra seat belt harness that you attach to the airplane seat. Approved to use in Canada and easy to use. Your child must have their own seat forward facing, not for lap-held children. This is great if you're not bringing your own car seat on-board or checking it at the gate. Means less to carry within airports. 3// Passenger Log Book: I love these log books for kids. Try to get one before their first flight so you can have a record of all their travels. A great keepsake for when they are older. Try to hand it in to a flight attendant early in the flight so that the pilots can fill-in all the info. 4// BABYZEN YoYo Stroller: you need to check out this stroller. I first discovered this stroller last year in Florida and regret not buying it. It literally folds to the size of a carry-on (if not smaller) and super light. Definitely worth the high price tag. 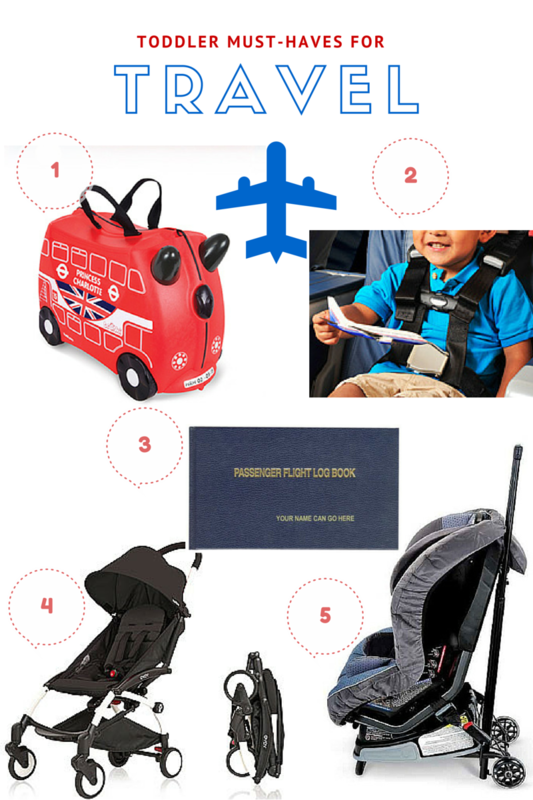 5// Britax Car Seat Travel Cart: this is a fantastic idea! For those that must have a car seat for their travels this is a great way to bring it with you. Better if you don't need a stroller as you'll mostly be travelling by car at your destination. Easily fits in the overhead bin (take note though smaller airplanes will have less overhead room so you might have to gate check it) and your child can sit in the car seat for short periods of time while you roll at the airport. Safe travels this Summer maybe I'll get to see you in the friendly skies!